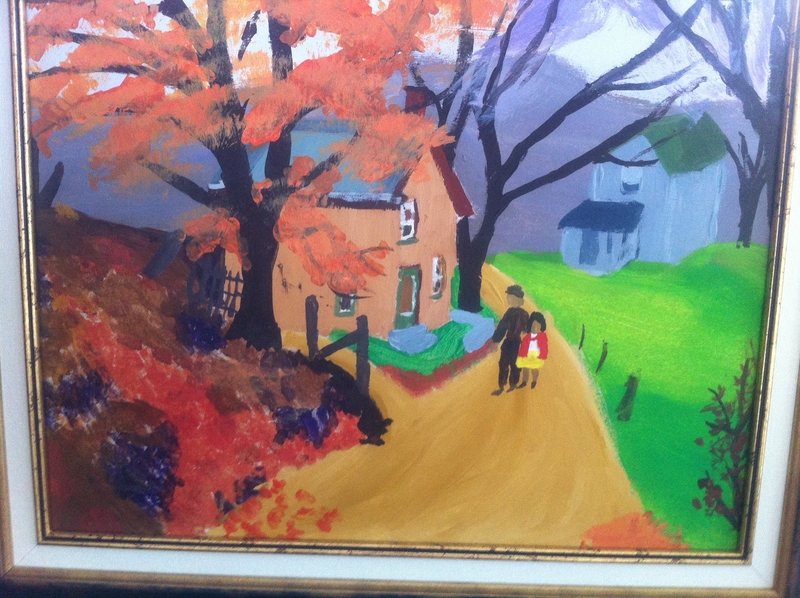 Painted in grade 8, many, many years ago. I stopped briefly at my late aunt’s house today and was helping sort through things when I kept looking at this painting. I was a little surprised that my aunt would have some folk art in her home. And then I realized it was something I had painted in grade 8! Our relationship was not a close one at all. At one point we had one, but as I got older and more outspoken and her life took turns and twists we grew completely apart. I didn’t even know if she ever even thought about me. So it was more than moving to realize that something I had created as a young girl was treated with such dignity and honour by my aunt. She had it professionally framed (which is why I didn’t even recognize it at first). It was obviously hung somewhere in the house. It meant something to her. I meant something to her. It feels really raw to realize this. All these years (decades) we hardly spoke. Yet all these years my art was on her wall. Knowing this does something to me. It lifted my chin a little and my shoulders pulled back just a touch. There are very few things that I want to duplicate from my aunt’s life, but I hope that I can duplicate that feeling in my own children, nieces and nephews. That feeling that they mattered to me. This entry was posted in Thoughts on life and tagged art, esteem, family, Memories, relationships on August 11, 2012 by strongandpure.